One of the things that I love about Moab, Utah is the juxtaposition of desert and mountain environments. Midway between those two extremes is the Moab Rim, a towering escarpment that overlooks the Spanish Valley and the town of Moab. According to information on the website “The Geologic History of Moab”, during the “Tertiary Period, the Moab Fault allowed salt to erode, collapsing the center of an anticline. A fault line runs down either side of the Moab valley, joining just upstream of the Moab Uranium Pile, near the entrance to Arches National Park. Perhaps because of water running down along the fault line, salt dissolved away deep under the rock of Moab. The overlying slab sunk down, creating a 'collapsed anticline' that is the Spanish and Moab valley”. Bisected, as it is, by the Colorado River, one wonders if the whole valley might at one time have been a lake, impounded on the downstream side by that solid rim. If so, did it slowly and inexorably wear away until the river canyon established itself, finally reaching the natural, smooth gradient that the river exhibits today? If any geologists know the answer to this question, we would love to hear about it via email. The Grand Canyon of the Colorado River is famous to most visitors as a place where we look down and into the canyon. The Spanish Valley is a place, similar to Zion National Park where, for the most part, we look up to the canyon rim. One exception to this is if you hike the Hidden Valley Trail, which climbs 680 from the valley floor to the top of the rim and a final elevation of 5270 feet. From there, one has myriad views that include Potash, Moab, the Spanish Valley and Geyser Pass in the Manti La Sal National Forest. Since the whole hike is only two miles one-way, it should be on the “to do list” of every reasonably fit visitor to Moab. If you plan to hike the trail, it is best to start early, before the heat of the day. Take plenty of water and a camera to document the spectacular scenery and late season wild flowers. Since this is a protected area, do not stray from the path, as even one off-path hiker can leave tracks that will not heal for years, if not decades in this fragile environment. Another way to enjoy the Moab Rim is from below. My favorite place for doing this is west off of Highway 191 on Canyon Rim Road, which starts on the south end of the Moab Rim Campark (at 1900 South Highway, 191, Moab, Utah). The pavement ends just past the power lines that parallel Highway 191. If you continue up the dirt road, you can park where the road turns right and get out of your car. With its easy access and immediate remoteness, it is a great place for a disabled visitor to get away from civilization for a bit. 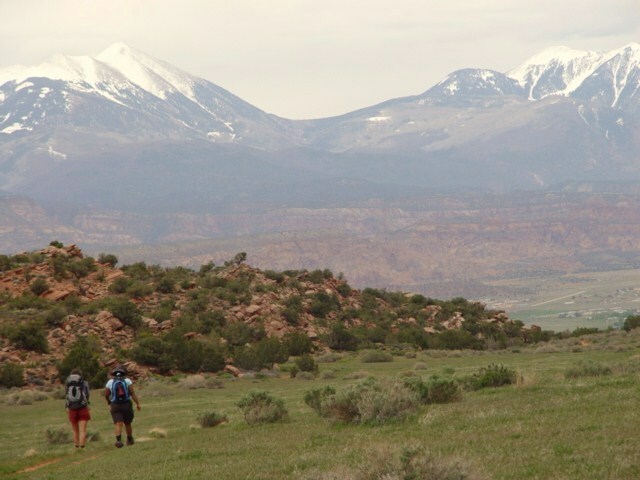 If you have four-wheel drive, or are riding a mountain bike, you can continue on to a series of connecting dirt tracks that take you to the base of the Moab Rim. Either way, there are several desert watercourses (dry, except during a storm) that you can walk without damaging the fragile soils and plant life that you will encounter. One of the best times to visit the base of the Moab Rim is at dusk. From there, you can watch the sun set behind the rim and see Moab transform from an apparent lake of trees into its nighttime incarnation as a brightly lit tourist town. You will still hear traffic on the highway, but it is muted and unobtrusive. After the sun dips below the Moab Rim, the desert air will cool considerably, so bring at least one layer of clothing beyond what feels right while the sun is still up. Since this is one of my favorite places in the Spanish Valley, please do our environment a favor if you visit here. Bring a plastic grocery bag and fill it with any beer bottles or other small trash you might find there. If each visitor removes even a small amount of trash, the occasional “hell raiser” will be less likely to see this as an open dumping ground. If the Moab Rim were located anywhere else except among the profusion of natural wonders that surround the Spanish Valley, it would probably rank National Monument status. Since it is open land and policed on the honor system by the Bureau of Land Management, I hope that everyone who cares about the Moab Rim will help protect and enjoy its unspoiled beauty.